U.S. Census Bureau workers are off the job due to Washington’s partial funding shutdown. As a result, current statistics on housing starts, retail purchases and foreign trade are not available. This is no minor matter. It will be difficult to accurately calculate national output – i.e., the important gross domestic product (GDP) measure – without reliable data on many of its key components. GDP growth, or lack thereof, is one key determinant of Federal Reserve interest rate moves. The Fed will struggle over whether to be ‘hawkish’, ‘dovish’, or stick with neutral. Furthermore, the ramifications of economic data omissions are not solely limited to the U.S. The U.S. and China are engaged in a trade skirmish, with tariffs on Chinese goods entering the U.S. slated to increase to 25% from 10% at the end of March, if there is no resolution. The U.S. has been running a huge trade deficit with China for years. In many months, it has been in a range of 40% to 50% of the total U.S. merchandise trade shortfall with all nations. 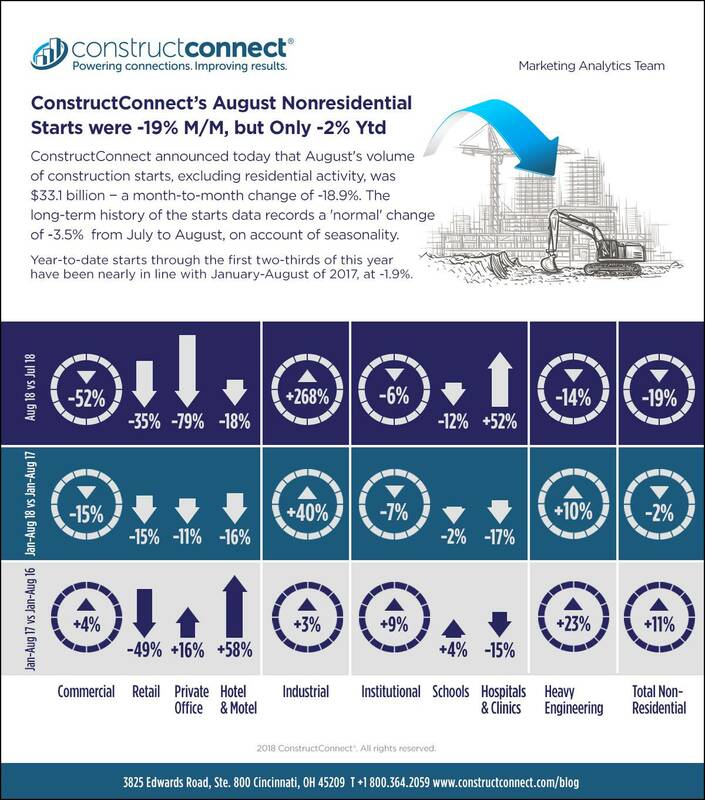 Compared with August of last year, this year’s latest-month nonresidential starts volume was -9.5%. Relative to the nonresidential five-year average for August, from 2013 through 2017, this year’s latest-month starts volume was +2.7%. Year-to-date nonresidential starts in 2018 compared with the same January-August time frame of 2017 have been -1.9%. ‘Nonresidential building’ plus ‘engineering/civil’ work accounts for a larger share of total construction than residential activity. The former’s combined proportion of total put-in-place construction in the Census Bureau’s July report was 55%; the latter’s share was 45%. The all-jobs increase for the U.S. economy in August was +1.6% year over year, according to the latest Employment Situation report from the Bureau of Labor Statistics (BLS). Hiring by the construction sector has been more robust, +4.3% year over year. The month-to-month nominal jobs increase in construction in August was +23,000, the same as the average monthly gain since the beginning of this year. Construction hiring on average for January-August 2018 is up by one-third versus 2017’s +18,000 monthly average for the first two-thirds of 2017. Construction’s current unemployment rate is 3.4%, the same as in July, but down from 4.7% in August 2017. Construction’s jobless rate is lower than the ‘headline’ figure for the whole economy, 3.9%. Aficionados of horror movies know there are certain things – e.g., the proximity of Frankenstein’s monster – that will cause ‘the villagers’ to pick up their pitchforks and charge into the woods for a confrontation. It’s widely understood that the ‘villagers’ are you and me. Such works may be escapist fiction, but while basic safety and security will always be a primary concern in real life, there are other terrors in non-fiction that are equally likely to incite our concern and ire and they’re mainly economic – e.g., a scarcity of jobs or sky-high prices. With respect to inflation and rapidly increasing price levels, this article looks at three products that for many people are essentials – rent, gasoline and coffee. Charts 1 through 6 show the year-over-year percentage changes of the rent, gasoline and coffee sub-indices within the broader Consumer Price Index (CPI) data produced by the U.S. Bureau of Labor Statistics (BLS) and Statistics Canada. In the U.S., media headlines immediately prior to Memorial Day Weekend carried the message that travelers taking to the roads were about to discover that a fill-up at the gas pump would cost them nearly one-third more than a year ago. The stronger U.S. economy has been contributing to more demand for gasoline. According to the website, www.gasbuddy.com/charts, the average price of gasoline in America is now $3.00 USD per gallon. Last year at the same time, it was $2.40. The increase has been +25%. 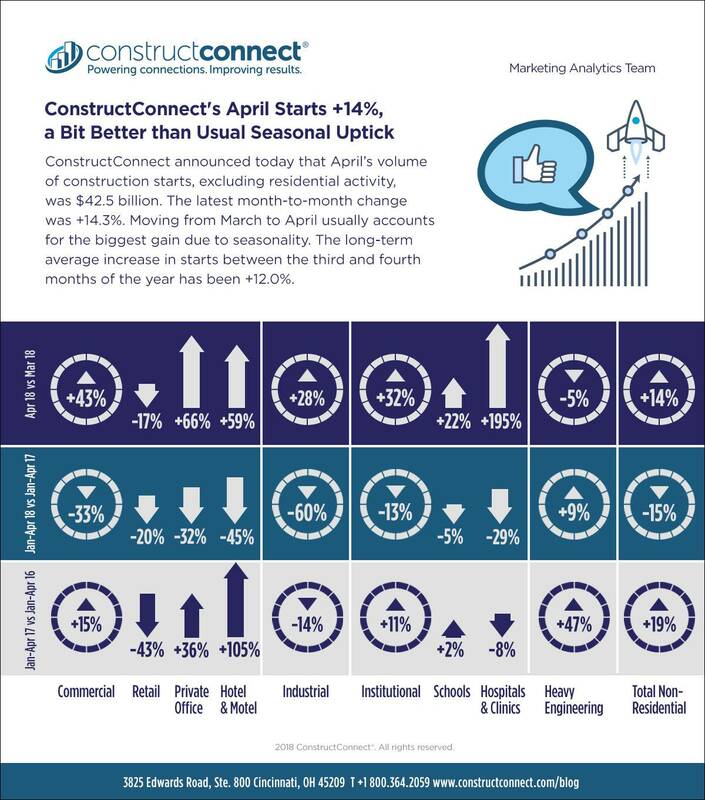 ConstructConnect announced today that April’s volume of construction starts, excluding residential activity, was $42.5 billion. The latest month-to-month change was +14.3%. Moving from March to April usually accounts for the biggest gain due to seasonality. The long-term average increase in starts between the third and fourth months of the year has been +12.0%. April of this year versus the same month of last year was -5.0%. April of this year versus the five-year average for April, from 2013 through 2017, however, was a much better +28.8%. April 2018’s year-to-date performance was -15%. Still, that was an improvement over March’s first-reported pull-back of -22%. The year-to-date percentage changes early in 2018 are being held down by Q1 2017’s exceptional strength in starts. This effect will gradually dissipate. Part 1 of this Economy at a Glance introduced the topic of a dozen major ways in which the structure of society and the framework of the global economy are changing beyond what humankind has ever experienced before. In Part 2, let’s dive right in with transition number (4), which will then lead organically into (5) and beyond. (4) Rock star central bankers: Given that establishment politicians have been passing out of favor, maybe it’s just as well that central bank Chairmen and Governors have stepped into the spotlight. Changes to taxation, spending and other fiscal tools to guide the economy have fallen out of favor and almost the whole responsibility for managing output, employment and other prosperity indicators has fallen on each nation’s central bank. In the early going of 2016, the headline story has been the heightened level of anxiety displayed by stock market investors. Versus 2015’s year-end closings, both the Dow Jones Industrials index and the S&P 500 are -6.0%; NASDAQ is -7.8%; and the Toronto Stock Exchange, -5.2%. The main widely-cited reason for the sell-offs has been an expectation of weaker growth in China. There are two highly-charged ways in which such a pull-back has unfortunate repercussions for the U.S. and Canadian economies. First, the value of the yuan is being lowered, to make the price of Chinese exports more competitive in world markets. Talk to a demographer and he or she is likely to tell you that everything important that is happening in society and business can be explained by their practice or science. As an economist, I don’t fully subscribe to such an assertion. Besides, what would I do if I didn’t have interest rates, inflation and government policy to mentally juggle as well as the study of demography? But I don’t dismiss the claim out of hand either. It does warrant admitting that population level, change and age-structure over time are key determinants of construction activity in several major type-of-structure categories. That will be the focus of this Economy at a Glance, in two parts. The story will be told through the use of eight graphs.